Left Voice speaks with Marxist labor historian Nelson Lichtenstein on the lessons of the Teachers’ Spring and the signs of a resurgent labor movement in the U.S.
Arielle Concilio: What are your impressions of the strike wave happening across the education sector in the United States? Why do you think we are seeing this surge now (particularly among Trump’s base) over a year into Trump’s administration? Nelson Lichtenstein: That’s an excellent question; you aren’t the only one asking it. Yesterday the Wall Street Journal asked me the same question. So, left to right in America, people are taking note of this phenomenon. Frankly, it was notable for many reasons: its size, of course, but even more so it was taking place in what had been the most conservative states in the country, ones in which unionism had been discouraged both in law and politics, and in the political leadership of the unions themselves. And the law made it very difficult for unions to operate. These were technically illegal strikes, but they had tremendous support, and not just among the strikers, but also parents who wanted the education to be better and even school boards, who normally are in opposition to the teachers, who were not only asking for more money form teachers, but for refunding the entire educational enterprise. That said, I was struck by the degree to which the center of gravity of U.S. working-class activism and trade unionism is becoming increasingly centered in the public sector. It’s more like Latin America, where you have teachers who are often the vanguard of militancy, and I think we see this here. They’re not really strikes against the state itself, but against the wealthy interests; oil, and coal mining, and other groups who have not been taxed enough to pay for public services that were needed. And so it was a tremendously hopeful thing for the left, and it has spread, and that’s what’s very hopeful about the whole thing. AC: Can you talk specifically about the recent University of California workers’ strike? How did they organize? NL: Well, at UC this was a strike of basically buildings and groundskeepers, some technicians, and blue-collar workers, and they were in all the campuses, so at least 25,000 workers. It was a three-day strike, sort of a demonstration strike. It’s remarkable that the UC has been systematically underfunded by the state for years and years, and at this particular stage in California, there’s a boom going on. California has this terrific, important world of technology— Apple, Facebook—they are all headquartered here, making billions of billions of dollars. This money has not been sufficiently funding the infrastructure of the state of California. And really, all strikes of the public sector are now political strikes. This strike really was to demand that the UC , which gets some money from the state, sufficiently fund the infrastructure of UC. It’s a large structure with hundreds of thousands of students, tens of thousands of faculty. The amount that the workers were asking for, a 6 percent raise, was not a dramatic amount, but the university was resisting, and we need to break the log jam of the underfunding of the public sector in the U.S. I think that’s what puts together the teachers strikes in West Virginia and Arizona with the UC workers. Also, the workers on strike were 80 percent Latino. The working class in California, both in the public sector and the private sector is predominantly Latino, mostly from Mexico and Central America. Today it resembles the U.S. in 1910 when Eastern Europeans and Italian anarchists and Jewish, Yiddish socialists were the vanguard of the working class, and I think that’s increasingly the case. Blue-collar work in California and Texas, and many other states, the working class is Latino. And the working class in this country is immigrant, which makes the anti-immigrant activities both racist and anti-working class. AC: In your first book, Labor’s War at Home, you discuss the role of accommodation to the labor bureaucracy in the ‘40s as a key reason for the decline in militancy in the U.S. labor movement. How do you see the union bureaucracy’s effect on the labor movement today? How do you see the relationship between the union bureaucracy with the state and the bourgeois parties, and how the dems were part of that decline? NL: I’ve written about this when I started off my career. When you have stable trade unionism, which, for a couple or three decades we had after WWII, trade unionism seemed to be accepted by the capitalists in this country, and the kind of mechanism for ameliorating and resolving otherwise violent class conflicts, so it was a really stable system. You had big unions of steelworkers, auto workers, which kind of organized their industries thoroughly. You developed a kind of bureaucratic way of doing things, and issues of internal union democracy were very important to the left. And there were cases of wildcat strikes, which meant unauthorized strikes, and things of that sort. Since the 1980s, however, trade unionism had become much more on the defensive, much smaller, much more fragile. It’s not stable. We don’t have these big unions which negotiate for a whole industry anymore. Trade unionism is almost like guerilla warfare these days, so while we do have trade union leaders who are clearly hesitant and sometimes strike terrible deals, and would like to be a kind of self-satisfied bureaucrat, they don’t have that. In this environment that’s much less possible. So in general, the trade union movement actually moved to the left and to some extent had become more democratic because it had become more marginal and more threatened in the country as a whole. Take the Teamsters Union, for example, I mean it’s run in a very autocratic and corrupt fashion. But the leadership of the Teamsters Union used to cut deals with the Republicans, and now they don’t cut deals with them anymore. Like I said, the Teamsters Union is now for Democrats. Now, that’s not such a left-wing thing, but in their history it is. And so I would say that the key obstacle to a trade union resurgence in the U.S. is not so much the conservative leadership of the unions, although you can certainly find that there, and I can point it out myself in many places, but rather the evisceration of the labor law, which makes it basically illegal to form unions in many parts of the country. And the divisions of the working class have also been exacerbated by Trump and others, so this is partly the situation we find ourselves in. AC: With the recent wave of strikes, and the women’s movement there is the possibility that young people will become radicalized through strikes rather than social movements. What prospects do you see for a more militant labor movement in the U.S. today ? NL: The great Women’s March had enormous impact. I mean the people who were involved with that were mainly women and working class, in addition to being primarily people of color. And that was certainly true of the teachers’ strikes and the whole service sector. There’s a kind of a symbiotic relationship between that anti-Trump march, the #Me-Too movement against sexual harassment, and the formation of the strikes and trade unions in heavily female-dominated professions. So I think that’s absolutely the case. I think that today, when something like 40% of all young people are happy to call themselves a socialist, you know this is a product of Bernie Sanders, and also I think the end of the Communist regimes in Eastern Europe, which now is over for a whole generation because now socialism isn’t associated with that. Of course, there is also stagnation in living standards for young people in the last several decades. That means that I think that the possibility of unionism and strike activity is a kind of moment of radicalization. We’ve seen, for example, graduate students form unions, so the impulse for unionism is there in the Ivy League and other places as well. I think that in the strata of professionals and wannabe professionals and lower-level professionals of teachers and journalists and programmers, this element is also in motion, and its gotten larger. This element is vital to the economy, it’s highly skilled and educated, and it’s moving to the left, whether it’s strike activity per se or just unionization. And by the way, unionization is equivalent to a strike in terms of consciousness changing because unions are so vilified by employers. If you wanna form a union, you’re sticking your neck out, that’s for sure. So I think people who want to form a union have a very transformative event in their lives. NL: As an old socialist, I’m delighted with what’s going on. I think that despite the political dysfunction at the national level, there is a social movement in formation here. 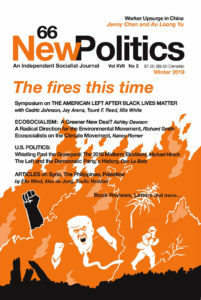 The word "socialism" is coming closer to the fore of U.S. political consciousness, and it hasn’t been in many decades. Originally posted at Left Voice.